Dec. 14, 2011: On Nov. 26th, Curiosity blasted off from Cape Canaveral atop an Atlas 5 rocket. Riding a plume of fire through the blue Florida sky, the car-sized rover began a nine month journey to search for signs of life Mars. Meanwhile, 93 million miles away, a second lesser-noticed Mars launch was underway. Around the time that Curiosity’s rocket was breaking the bonds of Earth, a filament of magnetism erupted from the sun, hurling a billion-ton cloud of plasma (a “CME”) toward the Red Planet. There was no danger of a collision—Mars rover vs. solar storm. Racing forward at 2 million mph, the plasma cloud outpaced Curiosity’s rocket by a wide margin. Next time could be different, however. With solar activity on the upswing (Solar Max is expected in 2012-2013) it’s only a matter of time before a CME engulfs the Mars-bound rover. That suits some researchers just fine. 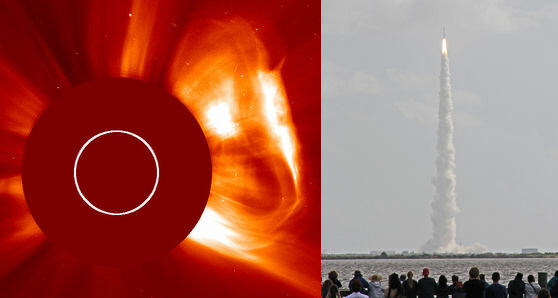 As Don Hassler of the Southwest Research Institute (SWRI) in Boulder, Colorado, explains, “We look forward to such encounters because Curiosity is equipped to study solar storms." 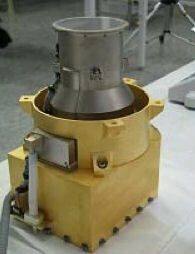 Hassler is the principal investigator for Curiosity's Radiation Assessment Detector--"RAD" for short. The instrument, developed at SWRI and Christian Albrechts University in Kiel, Germany, counts cosmic rays, neutrons, protons and other particles over a wide range of energies. Tucked into the left front corner of the rover, RAD is about the size of a coffee can and weighs only three pounds, but has capabilities of Earth-bound instruments nearly 10 times its size. Encounters with CMEs pose little danger to Curiosity. By the time a CME reaches the Earth-Mars expanse, it is spread so thin that it cannot truly buffet the spacecraft. Nevertheless, RAD can sense what happens as the CME passes by. "RAD will be able to detect energetic particles accelerated by shock waves in some CMEs1," says Arik Posner of NASA’s Heliophysics Division in Washington DC. "This could give us new insights into the inner physics of these giant clouds." There’s more to this, however, than pure heliophysics. Future human astronauts will directly benefit from RAD’s measurements during the cruise phase. "Curiosity is nestled inside its spacecraft, just like a real astronaut would be," notes Frank Cucinotta, Chief Scientist for NASA’s Space Radiation Program at the Johnson Space Center. "RAD will give us an idea of the kind of radiation a human can expect to absorb during a similar trip to Mars." Of particular interest are secondary particles. Galactic cosmic rays and solar energetic particles hit the walls of the spacecraft, creating an inward spray of even more biologically dangerous neutrons and atomic nuclei. RAD will analyze the spray from the only realistic place to make such measurements—inside the spaceship. RAD was activated on Dec. 6th. Of the rover's ten science instruments, it will be the only one active during the cruise to Mars. Daily transmissions to Earth will let Hassler and colleagues monitor what's going on "out there." "We're very excited about the possibility of more solar storms," he adds. As important as RAD’s cruise phase measurements are, the instrument’s primary mission doesn’t really begin until it lands on the Red Planet. Solar storms are just for starters. Stay tuned to Science@NASA for the second installment of this story: Curiosity and the Habitability Mars. Footnote: 1Posner notes that only the most powerful CMEs will still be accelerating particles when they are as far from sun as Curiosity will be. For a typical CME, the main thing RAD will detect is the modulation of galactic cosmic rays passing through the CME. Cosmic ray modulation could reveal new information about the interior structure of these storm clouds. Credits: The Mars Science Lab mission is managed by JPL, a division of the California Institute of Technology in Pasadena, for NASA's Science Mission Directorate in Washington. The rover was designed, developed and assembled at JPL. NASA's Launch Services Program at the Kennedy Space Center in Florida managed the launch. NASA's Space Network provided space communication services for the launch vehicle. NASA's Deep Space Network will provide spacecraft acquisition and mission communication.